I don't think that the bar that holds the tilt bob is supposed to be the part that sets off the mechanism? Someone help me here? Did I totally beef this?! Oh my gawsh, you guys! DTZ5 construction week is coming up! I'm going to try and post while Alec and I are frantically assembling these little bundles of pinball love, but no promises! Just a quick Dream Machine for you guys to start your week! This was originally posted on the Stern Blog, but in the spirit of thoroughness, I just wanted to share it again! There was a *clever* jab by someone on the original Stern post that commented on how I must not like to read, or I must be dumb; I really forget. Oh wait, now I remember! I remarked that a library is probably one of the dullest settings for a pinball machine, and THAT makes me a dullard! Ha ha! Of coarse! Oh my GOSH, you guys! How have I not seen this Ford ad from last year where they use a pinball backbox to show how bad Parisian drivers are, and how much they can be improved by Ford's new car (supposedly). This is a great video! Ha ha ha! You thought I was going to show the covers!? Nice try! I just wanted to tease you all! 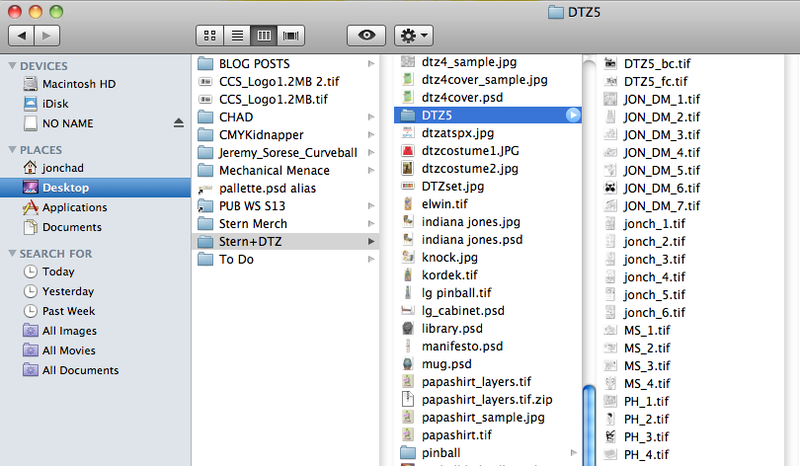 DTZ5 is very much underway, and the usually arduous process of screen-printing the covers is DONE. 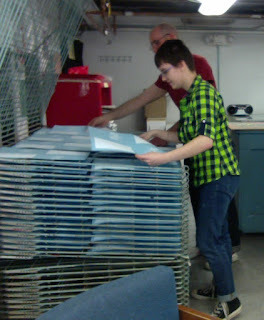 Big thanks to CCS second year Alexis Cornell for being my intern on this and helping me stack prints. 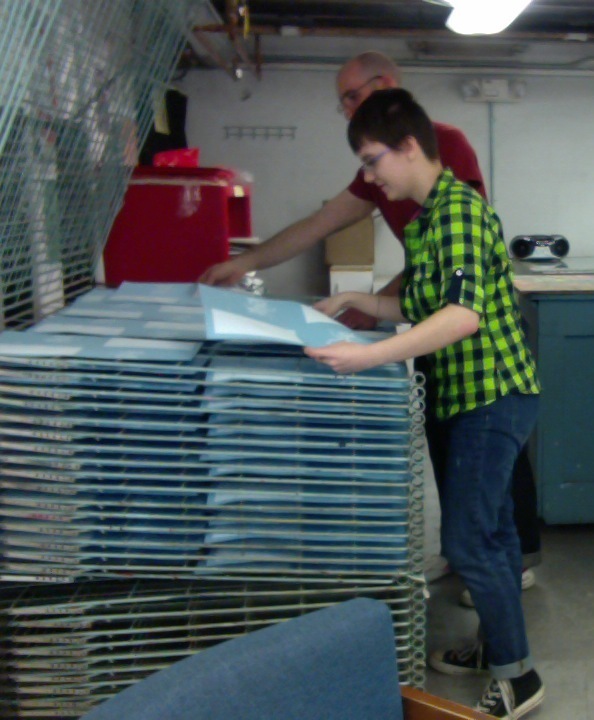 I've learned the hard way that it takes me 1/2 the time to screen-print if I have someone helping me stack prints. You guys! Get pumped! This issue is going to be fun! Hello Faithful Pinballers! I hope everyone had a happy Valentines day weekend! 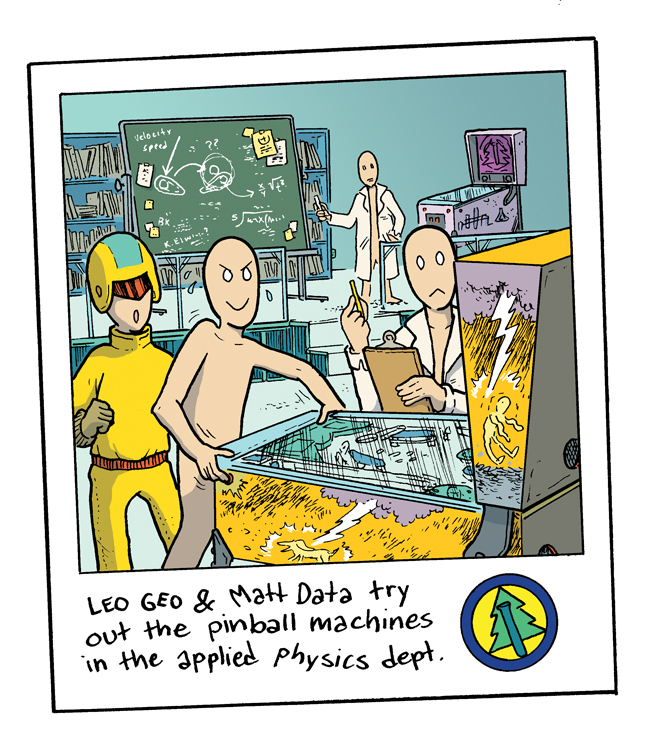 How many of you went out on pinball dates? Don't be shy? Did you get a smooch in the gentle glow of a High Speed? Anyway, we here in DTZ HQ have started to gear up for Drop Target #5!! I just finished my last spot illustration last week, and am putting the finishing touches on my comic. I still have to go though the 10 pages of transcribed interviews and do a little editing...ugh. Here's a little bit of proof, just so you all know that I'm not fibbing. I recently read about this on the PAPA Blog, and I just wanted to pass on the word! A team of rad artists and pinball enthusiasts in Pittsburgh, PA have a Kickstarter campaign going to make a series of one-of-a-kind, pained pinball machines by artists like J Fish and Coop. It's a cool project, and a cool video! Consider contributing! Ok, so here's what we have going on: the pinball hits the bottom lip of the pinball machine. This lip depresses, like a giant button, sends a signal to the coil control board to activate the the solenoid. 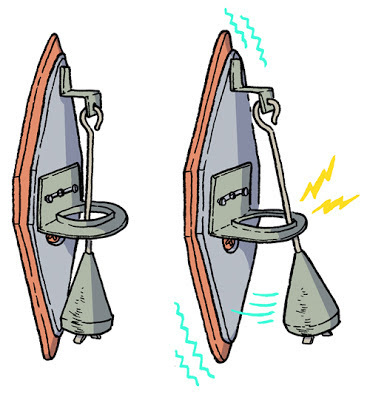 The solenoid is charged and becomes magnetized, driving the central piston down, this pulls the top ring of the pop bumper down, hitting the ball away. This all happens almost instantaneously. "So what's the big deal?" I hear you cry. Well that IS how a pop bumper works, but when I drew this that IS NOT how I thought it worked. Originally, I thought that the *metal* pinball would touch the top and bottom lips which I *thought* were made of metal. I thought this would compete and electrical connection that would activate the pop bumper. I tried to find the original art so that I could take a snapshot of it, but when I drew this, there was no arrow on the left illustration! It was a couple more of those shocking-bolt-electricity-things. My perception of pinball was so flawed! In what universe would the Jon Chad Pop Bumper System (trademark) work!?! 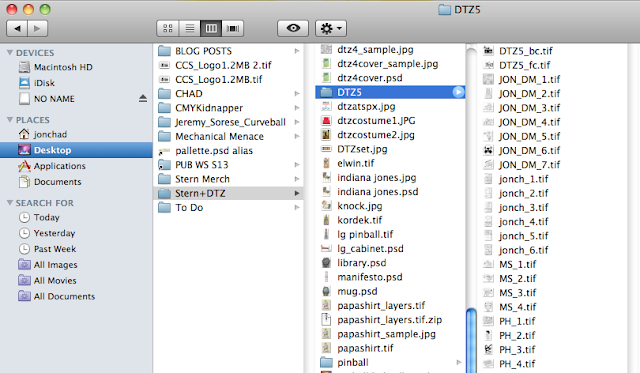 Luckily, I caught myself before the illustration hit the layout of DTZ one, and I "corrected" the image in Photoshop. 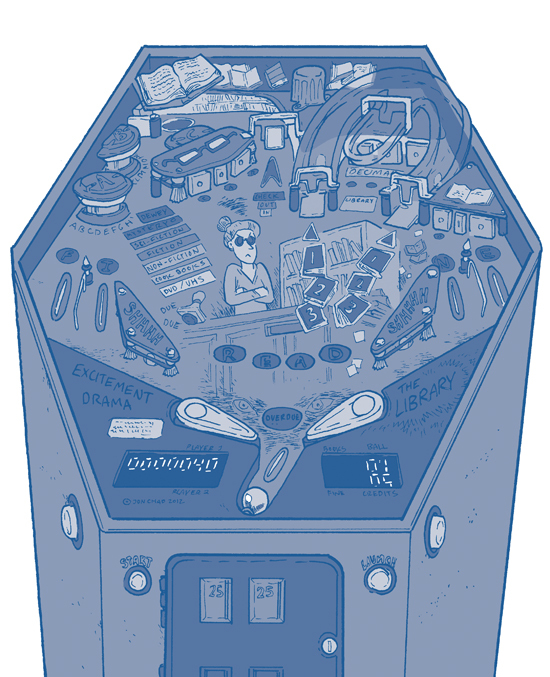 I might be making something out of nothing, but I think it's interesting how simple a pinball machine is, and yet can be so hard to initially understand. 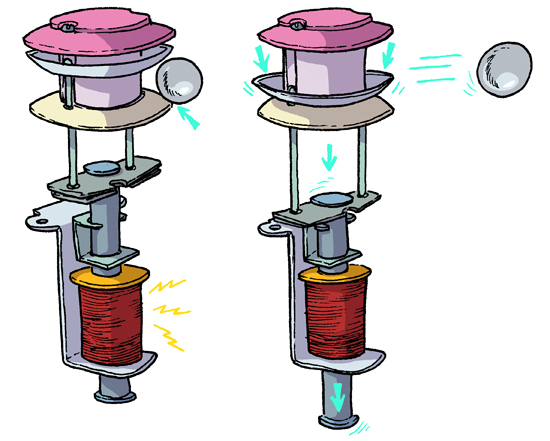 (Gets up on Novus box) I would LOVE to do an illustrated book where I describe the different simple machines that amalgamate to form a pinball machine! I'm putting this out there, universe! Make my dreams come TRUUUUUUUE!! Hello, as you all know, my day job is teaching at the Center for Cartoon Studies, and working on staff as their lab tech. On the side, though, I also work at the highly esteemed Fizmont Institute of Rad Science. There, I work as a Junior Director in the Department of Visual Histography, in the Auxiliary Imaging Division. Phew, that might seem like a mouthful, but the boys down in the Polysylabic Confidence Wing assure me that it's nothing to be afraid of! One of my jobs is to record, in images and words, some of the amazing experiments that go on at the Fizzmont Institute. I am also in charge of keeping track of archived visual materials. Take this for example. I found this photo in a bin that was heading for the incinerator, and I just HAD to keep it. 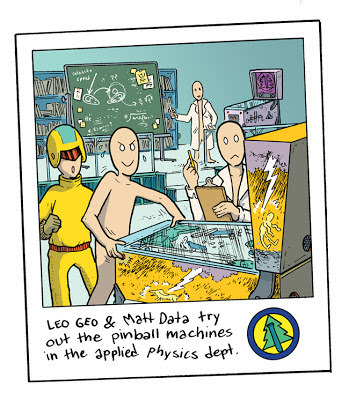 Here, we can see Dr. Leo Geo, and Dr. Matt Data playing some pinball in the Applied Physics Department. Man, those two scientists on the right look confused. I can only assume that Leo must be putting some hawt body english on that machine. Speaking of...what is that machine? Is it a "living things getting hit by lightning"-themed machine? Someone should follow up on that.